CREATION OF AWARENESS PROGRAMS AND USE OF LID TECHNOLOGIES – THE NEED OF THE HOUR. For the past several days, Gurugram as well as the nearby areas of the National Capital Region have been in the news for traffic jams, flooding of highways and dangerous potholes.So much so that even United States Secretary of State John Kerry, had this to say to students at Indian Institute of Technology Delhi while addressing them,” “You guys all deserve an award for getting here today. I don’t know if you guys came in boats or amphibious vehicles of some kind but I salute you.” The day before that, Mr.Kerry got to experience first hand just how bad the situation was in New Delhi, the capital of India, when he spent nearly an hour with his convoy trapped in traffic jams from the airport to his five-star hotel.A failed infrastructure, thanks to poor and flawed design calculations will not differentiate in adversely affecting it’s users. “The traffic police, politicians and municipal authorities are entirely responsible for the mess.”- This is not entirely true. Some politicians may have sanctioned under budgeted projects to win votes but it is ultimately shoddy design calculations which result in the chaos. Such is the impact of a poorly designed infrastructure, that when things go wrong, there is nothing much that the municipal authorities and traffic police can do from thereon. They can take some short term measures like drain cleaning or traffic management, but that really doesn’t address the root of the problem. “The public is responsible for the mess since there are so many cars.” – This is another cover up excuse. It’s actually the planners who have grossly underestimated the enterprising, forward looking nature of the people and in their arrogance, chosen not to provide sufficient spaces and flexibility of expansion of the infrastructure. While the efforts from various stakeholders are welcome, it is extremely important to go about seeking a solution to the problem of infrastructure development in the NCR in general and Gurugram in particular, in a “smart” way. Simply assigning blame to one political dispensation or the other is simply to grab onto the lowest hanging fruit. The first step would be acknowledging the fact that the problem of storm water drainage exists at several levels. 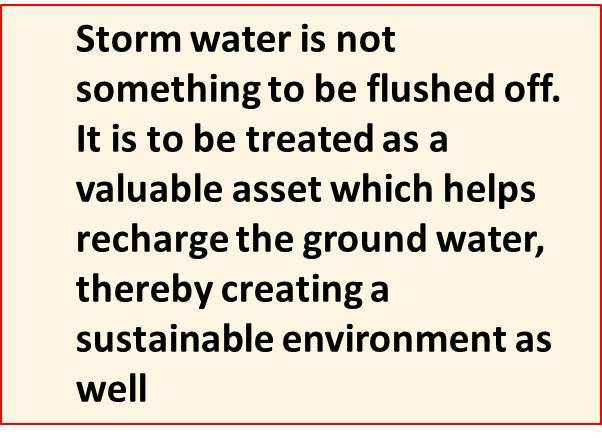 The second, most important step is to understand that storm water is not something to be flushed off. 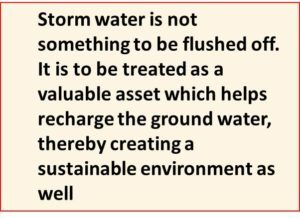 It is to be treated as a valuable asset which helps recharge the ground water, thereby creating a sustainable environment as well. It will take more than funds and ambitious proposals or political rhetoric to get smart. Here are a few things we should probably be giving attention to as well. It starts with the fact that several internal roads in Gurugram do not have storm water drains. Some of these roads have been designed by private developers, others by Government authorities and many others form part of the old Gurugram settlements. In some cases, where there are storm water drains, they are either designed incorrectly or the sweepers and the locals think that they are meant to dispose of garbage, whether its dust and debris on the road, an empty mineral water bottle or the left over construction debris (malba) of someone’s swanky new house. Most people are unable to differentiate between a storm water drain and a sewerage drain. After relentless abuse for the entire year, the storm water drains are expected to be prim and properly functional. 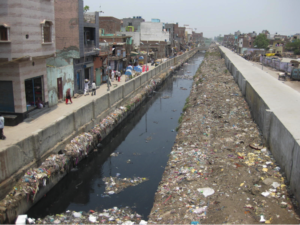 Take the example of the Najafgarh drain (what was once River Sahibi!! 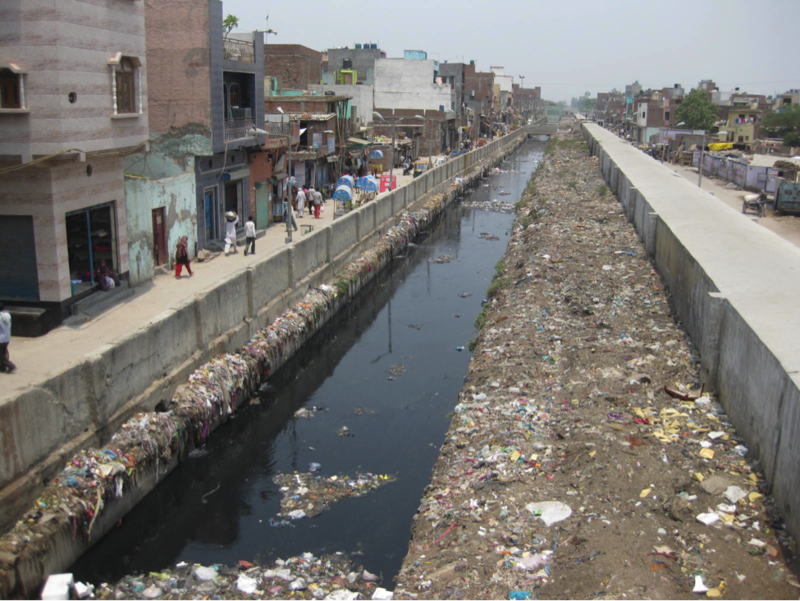 ).It is Delhi’s most polluted water body because of inflow of untreated sewage from adjacent populated areas. This is the “drain” currently being considered as part of the solution to resolve the water-logging at Hero Honda chowk. My best wishes to them. If we take a look at the factories/offices near Hero Honda chowk, one finds that quite a few of them are corporates with turnovers running into hundreds of crores of Rupees. Yet, the simple requirement for them to construct an Effluent Treatment Plant and a Rain Water Harvesting pit, makes some of them cringe and frown uncomfortably. Depending on the area, some of these corporates are unwilling to shell out reasonable amounts for construction solutions which would not only help make their own premises more sustainable, but also reduce the burden on public infrastructure. Oddly enough, they are happy to discharge contaminated by-products of their manufacturing goods into the public storm water drains and foot astronomical annual repair bills resulting from damage to property, instead of taking basic simple steps, mandatory as per laws. YOU CAN’T DESIGN WEARING BLINDERS!! 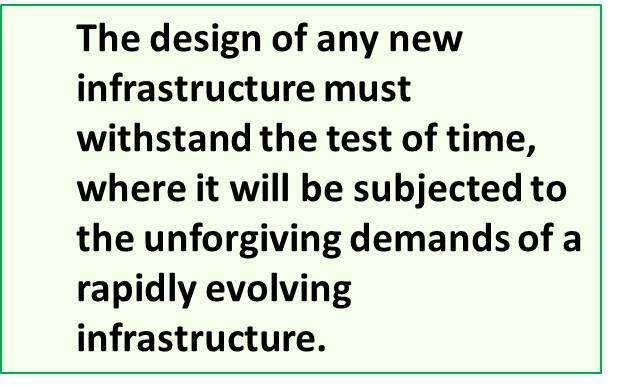 The foremost requirement is to accept that public infrastructure systems cannot be designed in isolation. Calculations for designing a storm water drain for agricultural land are very different from urban areas with impervious landscapes. On account of the Change of Land Use provisions, agricultural lands in Gurugram rapidly transform into Commercial or Institutional areas. 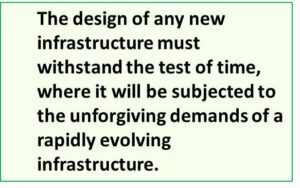 This leads to more concretization, thereby drastically reducing the amount of water which the soil can absorb.The design of any new infrastructure must withstand the test of time, in which it will be subjected to the unforgiving demands of a rapidly evolving infrastructure. We seem to fail repeatedly in this aspect and must take lessons from the past. The approximately 28 Km long Delhi Gurugram expressway is barely able to handle peak hour traffic. An investment of almost Rupees One Thousand Crores now seems to be a total waste after just 8 years of its inauguration. The population projection for Gururgram for 2021 of 16.5 lakh people made by the National Capital Region Planning Board was already crossed in 2012- nine years earlier. It seems that the planners have completely missed the enterprising and entrepreneurial nature of their Clients – the People. Unfortunately, most of latest construction technologies and materials do not even figure in the standard Schedule of Rates and Specifications of various Government bodies. In the recently aired program “The Big Fight” on NDTV news channel, eminent host journalist Vikram Chandra was seen literally begging the panel of “expert planners” and politicians about solutions to this specific problem of water logging. Sadly, not even the “experts” were aware of the concept of Low Impact Development and their “solutions” ranged from demolishing large areas of landmark structures to changing the entire organization structure of governance of India- something that may never happen. They threatened the audience with “dire consequences” such as “drowning” in the next monsoon. This myopic approach and refusal to reach out to corrective possibilities only contributes to the problem. The Schedule of Rates which is like the holy bible of most Civic and Finance Authorities is grossly out dated .The most unfortunate paradox is that these out dated documents are used, both for estimation and sanction of funds, for projects planned for future use. The same applies to potholes. 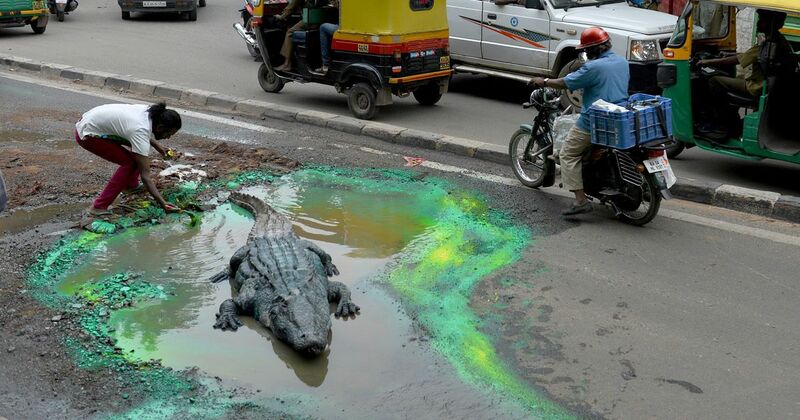 Ever wondered why the same pothole keeps appearing even after it has been repaired every monsoon? Proper drainage, preventive maintenance, use of surface dressing and veneer treatments will be a more effective approach to life cycle pavement management. Both the Supervisors and Contractors need training through skill development and knowledge transfer on pothole repair. This will lead to less reactive maintenance and proper maintenance scheduling. It’s not that the expertise does not exist in India. Most roads in the proximity of all Raj Bhawans (Governor’s residence) in State Capitals will be prim and proper for the entire year. Besides the impeccable maintenance and detailing, another reason for this is the low population density of such V.I.P. areas. This again brings out the need to design roads which are even more resilient, robust,with proper utility cut management and wider in areas of high population density. Unfortunately, many times these areas are left in the hands of private, inexperienced contractors and supervisors. The most profitable aspect of any construction job is that it’s ability to conceal it’s real defects.Potholes can often be indicators of a more serious underlying problem and would benefit greatly from the attention of expert supervision. By the time the defects are visible for all to see and experience, the construction agency responsible has usually moved on and people seek accountability from the the current dispensation. The United States has an estimated 55 million potholes and it’s reported that Canada repairs 4,50,000 potholes annually with a budget of 4.8 million dollars. That’s 10.7 dollars per pothole or Rupees 650/- to 700/- approximately. (This is the average cost, not actual cost per pothole- it depends on the size, depth and nature of pothole)So repair and preventive maintenance should not be such an unreachable concept. The beauty of any design, good or bad, is that its effects are inescapable and interconnected. The effects will be there for all to feel, whether it’s the Minister who misses an important meeting or the CEO who loses an important client or the general public. That lesson was amply demonstrated by the fiasco at Gurugram and other cities in India as well. While, the worst may not still be over, it would be helpful if all stakeholders honestly acknowledge the problems and failures and seek a holistic, long term solution to them. By merely sanctioning funds or proposing short term solutions in a hurry to win brownie points or shifting accountability we may be setting ourselves up for another inescapable debacle, creating “breaking news”- if you pardon the expression and looking around for alibis. Not exactly the SMART thing to do.